Have you been shocked at the price of your food shop recently? You’re not alone! No matter how careful you are, and how well you plan your meals, the fact is that food prices are on the increase . But, as supermarket prices rise, self sufficiency is becoming more popular, with growing your own fruit and veg, brewing your own beer and keeping chickens all making a resurgence. Keeping hens in your back garden is a great way to taste a slice of that good life, and it will save you money. Did you know that it currently costs £3.60 for a dozen free range eggs in Sainsburys? With your own chickens you’ll get those 12 eggs every week, for free, saving you a whopping £160 a year. You can buy an Eglu Go from £235, so it could take as little as 18 months to cover the cost (eggscluding the minimal price of chicken feed). The Eglu Go makes keeping chickens easy and straightforward. Made from plastic, it is incredibly quick to clean, and you won’t run the risk of a red-mite infestation. The double walled construction gives brilliant insulation, keeping hens warm in winter and cool in summer, and you can collect eggs without disturbing the chickens. There’s no need to fear Mr Fox, because the optional Eglu Run has a unique anti-tunnel skirt that will stop predators from tunnelling in, and you can shut the hens in the house at night so that they don’t get a scare. The Eglu Go has loads of other great features too, so click here to find out more! And, did we mention that eggs from your own hens taste a million times better than those from a supermarket?! Keeping just 2 chickens could save you £160 of eggs a year! What better eggscuse to get an Eglu? We’ve always argued the case that plastic beats wooden in the animal housing stake, but now that theory is being put to the test with a project called ‘Plastic Fantastic’. It’s the Beehaus VS. the wooden beehive in the experiment at Knowsley Safari Park…and we know what we’ve got our money on! This exciting new project is aiming to uncover the most effective way to protect British honey bees, testing the success of traditional National Cedar hives against the modern, plastic Beehaus. A total of 200,000 bees are being split between the two types of hive at two different sites, and they will be tested over three years. There will be studies on the colony performance, bee health and resistance to disease, and the honey production. And, boy will there ‘bee’ a lot of honey, all of which will be sold to fund further research. Project Leader, John Moran, said: “We can’t wait to get this project underway, and find out once and for all which hive is the ideal habitat for our British bees. Although we’d love the Beehaus to come out tops, we bee-lieve that this is a fantastic project whatever the outcome, bee-cause bees are the key to our ecosystem! And if you want to learn about keeping bees, and helping the planet, click here to read our guide! 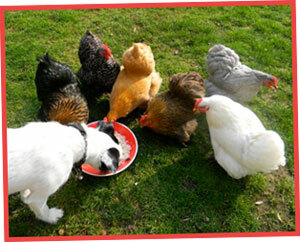 Chickens are lovers not haters, as Louisa Rowell has proven this month with a photo of her hens happily sharing a bowl of cous cous with the family’s Parson Terrier! It’s eggstraordinary to see the whole herd, plus dog, eating together with no arguments…after all, that doesn’t happen with most families, let alone pets. We think Buffy, Bella, Bow, Penny, Maisy, Lilly and Billy-Jack deserve to star in this newsletter for demonstrating a sharing and caring nature. Bravo! Want to treat your pets to a new palace? 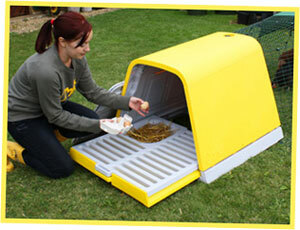 Send us a photo of your current rabbit or guinea pig hutch and we’ll give you £75 off a shiny new Eglu! We’ll even throw in free delivery too! Just email info@omlet.co.uk with your picture. But hop along because the offer ends on June 30th. Free Bees with Every Beehaus! Fancy some freebees? No really… free bees! Buy any Beehaus in June and we’ll give you a colony of bees for absolutely free! This will save you £180. Simply add your Beehaus to your shopping basket and enter this code when prompted: FREEBEES2012 But bee quick, because this offer ends on June 30th! Fancy starting a new hobby this Summer? It’s not too late in the season to start beekeeping! Keeping bees is a fascinating hobby that really will amaze you and give you lots of enjoyment. It is a great way of giving something back to nature, and you will be rewarded with a whole load of lovely honey. Tempted? Read on.. This month we’ve got a great incentive for you to start keeping bees: We’ll give you them for free! Buy any Beehaus before July and you will receive a colony of honeybees, worth £180, absolutely free. Bee-rilliant!! To claim your bees, simply add your Beehaus to the shopping basket and enter this promotional code: FREEBEES2012 It’s easy beesy! Valid until June 30th. Our Walk in Runs have been popular with chicken keepers ever since their launch last year, but it’s not just the birds that like them…it seems that cat’s have been getting in on the action too! 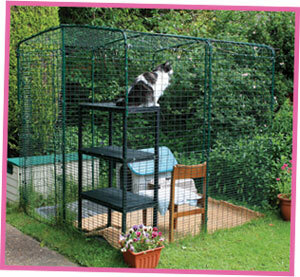 We recently heard from one cat owner that found the Walk in Run to be the perfect outdoor pen for her puss. If you think your cat would like a Walk in Run to play in, click here to read more. And if you already have one for your cats, why not send us a photo? The Walk in Run is so comfy that Anne likes to sit inside and have a cuppa with her cat. It’s been a busy month for Omlet products in the press. They’ve been in magazines and websites all over the place, and these are just some examples. The Beehaus featured in German magazine ‘Schoner Wohnen’, the most popular lifestyle magazine in Europe. The piece featured a selection of bee products, from hair wax to furniture to flats built like honeycomb. But the Beehaus stands out bee-rilliantly! Meanwhile, the Qute has been the star of a post on popular blog ‘Here we are Together’. Written by Miri, mother of three and homeschooling pro, this blog won the Sainsbury’s Bank Family Blog of the Year Award 2012. Miri chose a Qute after daughter Emily fell for a hamster in need of adoption. She rates it highly as it ‘minimizes clutter’, takes ‘one minute to clean’ and ‘looks like a piece of furniture’. Click here to read the blog, and if you want to read more about the Qute visit the website. 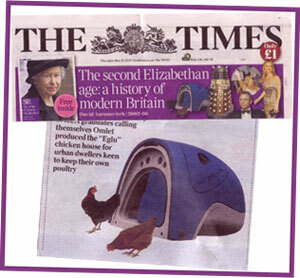 But this month, we were most eggcited to see the Eglu Classic on the front page of The Times! As well as a fab photo of the Eglu on the front cover, Omlet were included in the Diamond Jubilee History insert. Starring alongside Kate Moss, James Bond and the Dalek’s, the Eglu completed an impressive cast of icons, and it will most definitely go down in history. Like the newsletter? Join us on Facebook and Twitter to find out the latest news and offers!